Are Green Peppers Good for You? Green peppers have a wide range of health benefits due to the multitude of nutrients they contain. The peppers have a crisp texture and a slightly sweet flavor that makes them greatly versatile, allowing you to enjoy them in many ways. Bell peppers are part of the nightshade family and are abundantly available at most supermarkets year round. Understanding their health perks makes it much easier to incorporate them into your healthy eating plan. Check out the following nutritional perks of green peppers and you'll be ready to toss some in your grocery cart next time you shop. These values apply to raw green bell peppers and are courtesy of the National Nutrient Database for Standard Reference. According to the Mayo Clinic, fiber is a nutrient that helps regulate digestion by preventing constipation and keeping the intestines functioning normally. It also helps control weight because it is digested slower than other nutrients, which means it keeps you feeling full for longer. That's valuable for people who are watching the number on the scale. Fiber also helps control cholesterol levels and blood sugar, which means it plays a role in the prevention of both heart disease and diabetes. A cup of chopped green pepper contains about 1 1/2 grams of fiber. Adult women need 21 to 25 grams of fiber per day and adult males should be getting 30 to 38 grams on a daily basis, so including bell peppers in the diet certainly contributes. Bell peppers are one of the best sources of vitamin C. A cup of chopped green peppers weighs in with about 120 milligrams of the vitamin. Daily intake requirements are 75 milligrams for women and 90 milligrams for men, making green peppers an all-star way of meeting that quota. Vitamin C plays a role in healthy immunity, collagen production, wound healing and iron absorption, according to the Office of Dietary Supplements. Because humans don't synthesize vitamin C, it's important to get enough from food. Vitamin C is also an antioxidant, which means it helps fight free radical damage and can help prevent many types of cancers. A healthy balance of calories in to calories out is the best way to lose and maintain weight, according to the Centers for Disease Control and Prevention. A cup of chopped bell peppers contains only 30 calories. 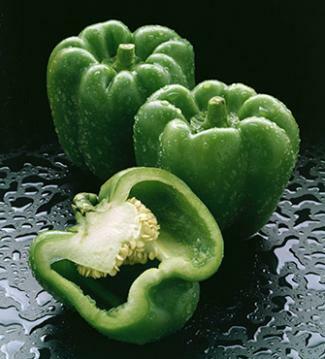 Combined with the fiber content, green peppers are an ideal food for controlling calorie intake. By adding green peppers to your meal plan, you can fill up on a very minimal number of calories. Like vitamin C, vitamin A is an antioxidant, which means it plays a powerful role in cancer prevention and a healthy immunity. In addition, vitamin A also supports healthy vision and reproduction and communication among cells, reports the Office of Dietary Supplements. That means this nutrient is important for the development and function of the heart, lungs and kidneys. A cup of chopped green bell peppers contribute 27 micrograms of the 700 to 900 micrograms recommended each day. That's not a lot, but green peppers contribute so much else nutrition-wise while adding a small bit to your vitamin A intake. A cup of chopped green pepper contains nearly 7 grams of carbohydrates. Before you back away and nix them from your diet, consider that your body converts carbs into glucose, which gives you energy. According to the Harvard School of Public Health, the carbs that come from vegetables are the good kind that give you long lasting fuel to help you power through your day, while also adding much to your nutrient intake. Green peppers aren't going to satisfy an entire day's worth of vitamin K, but a cup of chopped pepper contains 11 micrograms of the 90 micrograms needed each day. According to the National Institutes of Health, vitamin K is vital for proper blood clotting and healthy bones in the elderly. Green bell peppers taste equally as delicious whether they're cooked or raw. However, in some cases, cooking vegetables reduces their nutrient content. Vitamin A and C content can be reduced when green peppers are heated. Try these ideas for eating raw bell peppers and thereby preserving as much of the nutrient content at possible, courtesy of the experts at Food Network. Chop green peppers and add to cold gazpacho soup. Puree them with chickpeas to make hummus. Shred the bell peppers very thinly and add them to coleslaw or salad. Skewer chunks of green pepper with cheese and cold cuts on a toothpick for a healthy snack or appetizer. Slice and serve green peppers with low-fat dressing or hummus. While it's true that heating green peppers lowers the nutrient content a bit, they can still be part of a healthy diet when they're cooked. In Shape magazine's Cynthia Sass, a registered dietician, suggests sauteing, steaming, grilling or roasting the peppers to keep as much of the nutrient content intact as is possible. The nightshade family of vegetables, which also includes potatoes, tomatoes and eggplants, aren't healthy for people with certain health conditions. According to Michael T. Murray, co-author of "The Encyclopedia of Healing Foods" these vegetables can cause an exacerbation of symptoms among individuals with arthritis. If you suffer from this condition, talk to your doctor about a healthy amount of green peppers in your diet. If, after eating green peppers, your arthritis symptoms seem to flare, it might be a good idea to eliminate them from your meal plan. Murray recommends choosing firm, bright green peppers and staying away from those with dull, wrinkled skin. Bell peppers should feel heavy for their size. Store bell peppers in the crisper drawer of your refrigerator for up to one week. Mix and match your favorite serving ideas for new and fresh ways of enjoying green peppers.